The Way It Was (South Of Cardigan): Optare Excel YN53ELH on the 412 service (Cardigan-Newport-Fishguard-Haverfordwest). 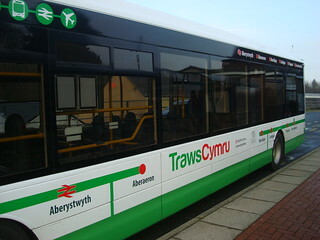 The T5 is branded as a service between Aberystwyth and Haverfordwest, but is largely operated in two parts; one between Aberystwyth and Cardigan and the other between Cardigan and Haverfordwest. This may be due to logistics, at least in part, since the long route is operated using vehicles from separate depots with each bus returning to its own depot each evening. Another possible reason for the split however is the fact that these were separate services before the introduction of TrawsCymru branding and the blanket T5 service number. To the north of Cardigan, as I have discussed previously, a significant change occurred prior to the introduction of the T5. The decision by Arriva to close their depot in Aberystwyth led to urgent discussions between local authorities and the remaining bus companies in the area in order to replace the services withdrawn by Arriva. As a result, the roughly two-hourly direct X50 service (Feb 2010 timetable here) was cut back to just one journey each way daily. The rest of Richards Bros’ roughly hourly buses between Cardigan and Aberaeron/Aberystwyth (about half of which operated via Aberporth) were all given the X50 number but diverted via New Quay. Services that previously terminated in Aberaeron were extended to Aberystwyth at the same timetable change. When the TrawsCymru T5 was launched around a year later, the schedule north of Cardigan remained very similar to the ’emergency timetable’ introduced to fill the void left by Arriva, with the operation south of Cardigan (formerly the 412) retimed to connect. Deceptively Straight: the TrawsCymru route branding gives the very-misleading impression that Fishguard is on a direct line between Cardigan and Haverfordwest (in reality it is far off the direct route). Aside from making the Haverfordwest-Fishguard-Cardigan services (that were once the 412) connect with the Cardigan – New Quay – Aberystwyth ones, the only significant change introduced with the T5 was the reduction in services making the detour via Trecwn to just 2-3 services each way (from 7-8 previously). This has of course speeded up those journeys, but even the trips avoiding Trecwn could never be described as direct compared to the B4329 route from Cardigan to Haverfordwest across the Preseli mountains. Something like this for New Quay, too? 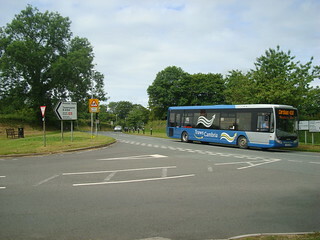 A bus in TrawsCymruConnect livery working the 460 service between Cardigan and Carmarthen. The solution to making the T5 north of Cardigan reasonably attractive (time-wise) for longer-distance journeys is fairly simple, reinstate the old direct journeys and run those that terminated at Aberaeron through to Aberystwyth (providing New Quay connections at Aberaeron in those hours). The old X50 timetable had one glaring omission; a direct 18:30 northbound service mirroring the 18:15 direct southbound working (the final direct northbound was the 16:00 (the one that still exists)). Fix that and I reckon you could have a very good range of bus services between Aberystwyth and Cardigan, apart from the need to bring back the 50 and 550 numbers for the journeys via Aberporth and New Quay. 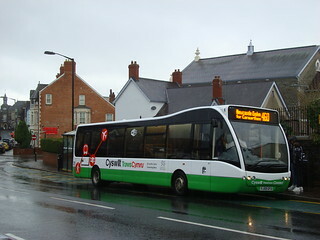 The 550 and 50 routes should also lose the TrawsCymru branding, perhaps becoming TrawsCymruConnect routes instead. The only drawback would be that New Quay’s hourly through service to Aberystwyth would be cut back to hourly to Aberaeron and roughly half that to Aberystwyth. Ideally that would be made up for by adding additional Synod Inn – New Quay – Aberaeron shuttles on an hourly basis, at least in the busy tourist season, to provide New Quay with a bus roughly every half hour. 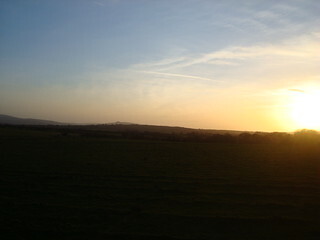 Not A Lot Of Passengers Here: a sunset vista with the Preseli mountains to the left. South of Cardigan is rather more difficult, since to my knowledge there have never been regular bus services using the sparsely populated mountain route between Cardigan and Haverfordwest. The hamlets on the B4329 are probably not sufficient to justify introducing a new bus service, making the T5’s current route via the much-larger settlements of Newport, Fishguard and Letterston the only one that makes sense financially (even with government subsidy). However, not using the B4329 means that private cars will forever have an enormous time advantage over buses for journeys between Cardigan/Eglwyswrw and Haverfordwest. In short, trying to persuade passengers out for their cars for Haverfordwest-Cardigan journeys is a lost cause, but in my experience the buses load well between Haverfordwest and Fishguard/Newport with passengers making shorter journeys. Bringing back the 412 as a local service and dropping the TrawsCymru brand south of Cardigan would therefore seem to make sense. TrawsCymru from Narberth: not such a good idea? 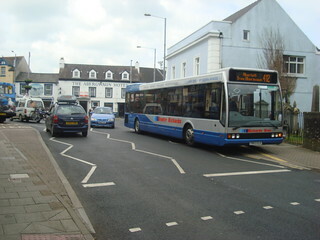 Former TrawsCambria bus leaving Narberth working the 430 service. But that’s being a bit defeatist and, like the current T5 service, quite unimaginative. If a TrawsCymru service to Haverfordwest is a lost cause, where else could the reduced-frequency, faster, T5 from Aberystwyth go south of Cardigan? 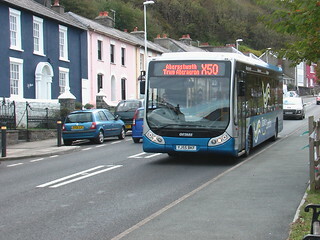 The other main routes are the 460 to Carmarthen and the 430 to Narberth. The 460 is itself rather indirect and using this would mean creating a second TrawsCymru route between Aberystwyth and Carmarthen (the T1 via Lampeter being the other). So that’s not sensible, and going direct to Narberth would require the introduction of a parallel local service (for the settlements the 430 currently detours to serve). Too expensive, I expect. Rub It Out: The TrawsCymru brand should be erased between Fishguard and Haverfordwest. 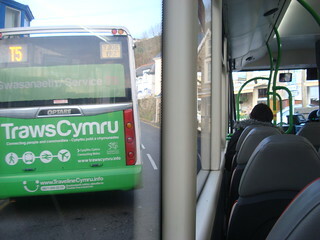 This is a TrawsCymru-liveried vehicle working the 412 before the T5 happened. Which brings us back to the traditional 412 route: Cardigan – Newport – Fishguard – Haverfordwest. But why keep it intact? 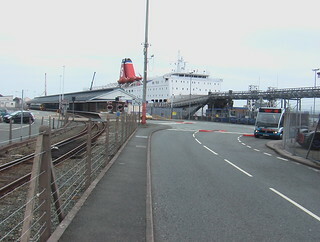 With through passengers in short supply anyway, due to the indirect route, perhaps just part of it could be TrawsCymru. Aberystwyth – Aberaeron – Cardigan – Newport – Fishguard would be pretty much direct, with the only detour being going through Cardigan instead of using the bypass as a private car would (curse bypasses). A connection at Fishguard for Haverfordwest would cater for the few going through, and remember that the new T5 would only be every two hours, so there could still be indirect through services between Haverfordwest and Cardigan/Aberystwyth (in the other hours). A small positive side-effect of the changes would be that Trecwn could have an all-day scheduled service back, by making the Haverfordwest-Fishguard connecting services (roughly every two hours, remember, as the Trecwn deviations on the 412 were) operate via the village. T5s In Goodwick: the only through service from Goodwick to Cardigan, seen from the only through bus from Cardigan to Goodwick. That is not the biggest prize from breaking the tradition of hourly through services between Haverfordwest and Cardigan however. As well being able to as more-truthfully market the T5 as a direct service, there would be a great opportunity to provide new through services to/from Cardigan, for example running through to St. Davids, incorporating the 413 service. Unfortunately the latter service has its own detours, but there is another option. The T5 might serve Fishguard, but neither Fishguard & Goodwick station nor Fishguard Harbour are on the route (except for one journey each way in the morning via Goodwick) and TrawsCambria (and by extension TrawsCymru) was in part about filling gaps in Wales’ rail network. If you drew a highly detailed map of the combined rail and TrawsCymru network, you would see the T5 heading straight for Fishguard’s stations and then swerving away just short of them. These are the closest railway stations to Cardigan, but reaching either by public transport (except on that one journey to Goodwick) requires a change of bus at Fishguard Town Hall. The return journey is simply impossible; the last bus to Cardigan leaves Fishguard before the first of the two evening trains arrives. Perfect Destination: bus, train and ferry meet at Fishguard Harbour; unfortunately at present the bus only goes to Fishguard town centre. Why not send the T5 here instead of Haverfordwest? Therefore, I propose that the T5 should morph into an Aberystwyth – Cardigan – Fishguard Harbour service roughly every two hours. 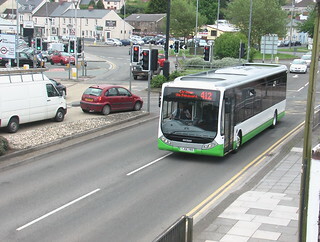 It would connect with a bus to New Quay at Aberaeron, a bus to Haverfordwest at Fishguard Town Hall and trains to Carmarthen, Swansea and Cardiff at Fishguard Harbour. There’s also the ferry to/from Ireland at the latter as a bonus. The 16:05 (via Aberystwyth college) and 18:15 departures from Aberystwyth in the old X50 timetable, if extended south, would tie in quite well with the two evening Fishguard workings in the September 2011 rail timetable. Having those two buses then return to Cardigan would provide the evening rail connections that are currently missing, although the later of those two trains has since been lost following Stena’s major ferry timetable changes last year. One hopes that the new rail franchise, due to start later this year, will plug all the large gaps in the timetable, including reinstating that train.